The yield curve between the 10-year and 3-month Treasury yield inverted, which has long been considered one of the best indicators of an impending recession. But what if you’ve been looking at the wrong yield curve altogether? JPMorgan seems to think so. 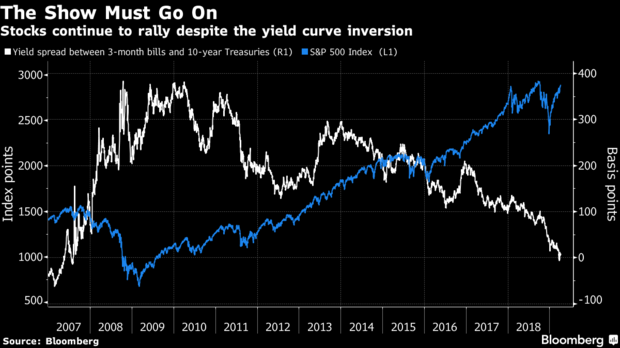 There’s concern that the recent inversion of the yield curve is a sell signal for the market, but critically there’s an average 18-month lag between such a move and the onset of a recession, Mislav Matejka said in a note to investors Monday. The strategist recommends looking at the spread between the 10-year and 2-year Treasury yields — which is about 18 basis points away from inversion — instead of using the inverted 10-year and 3-month Treasury yield difference that has stock traders on edge. Inversion — where yields at the short end of the curve are above those at the long end — has in the past been a reliable indicator of recessions. However, this time, equities continued rallying as the dovish U.S. Federal Reserve and trade-deal optimism encouraged investors that the slump in growth is still some time away. JPMorgan strategists predict that the curve might stop flattening and end up steepening into the second half of the year amid a trough in global activity. And even if the yield curve inversion has historically heralded bad times for equities, this time might be different, says JPMorgan, because monetary conditions remain soft. “We stay constructive on equities given the China turn, dovish Fed, potential U.S. dollar peak, pivot away from trade uncertainty and likely bottoming out in inflation expectations,” the strategists said. Next »With Divorce Drama Settled, Can Amazon Stock Deliver $5k Shares?